FormBiennial in North, may be perennial in South. FoliageMedium green, large, oval shaped basal leaves. Flower FormSpike up to 3 feet in length. Individual bell-shaped florets 1 - 3 inches. ColorMix of white, yellow, pink, purple, blue, or red. Our choice of colors. BloomsEarly Summer for 3 - 4 weeks. PruningRemove spent flower stalks if desired to tidy up the plants. CommentsOld fashioned flower. Towering stalks of deep-cupped flowers make an outstanding display. Excellent mix of colors. 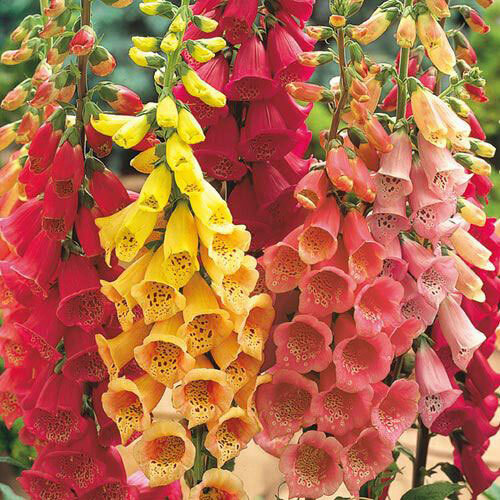 THE HEART STIMULANT, DIGITALIS, IS DERIVED FROM THE DRIED LEAVES OF THIS PLANT. FOLIAGE, FLOWERS AND SEEDS MAY BE TOXIC IF INGESTED. DepthPlant so the crown is just below the soil level.